» Natural touch control — use your real pool skills! The incredible pool game enjoyed by 2.5 million players every day is now available on Windows Phone! Challenge your friends, or compete against millions of players to win coins and trophies. 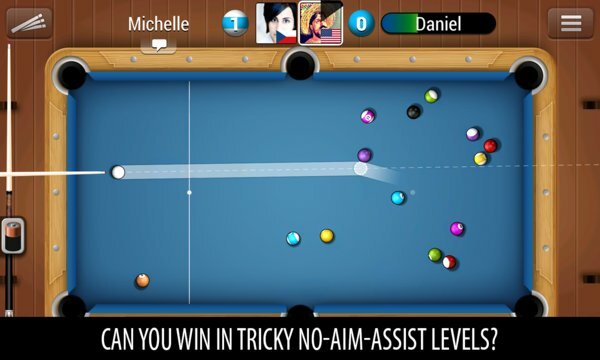 Practice offline in single player mode or against a friend to perfect your technique, collect the best cues and discover all the lively locations that make up this fun-packed pool game. #1 POOL GAME ON FACEBOOK! · Go head-to-head against real players live. · 2 500 000 players every day — you’ll find a worthy opponent in seconds, 24/7. · Invite your Facebook friends for a quick match. · The only touchscreen pool that feels just like the real thing. · Pull to set power and direction then release to shoot. Simple! · Add second finger to perform tricky spin shots. · Compete for coins and glory in the head-to-head Play & Win mode. · Facebook, tablet, phone … play against your friends wherever they are. · 2 player duel on a single screen — just the thing for those long journeys! · 5 amazing levels, each supporting aim-assist and no aim-assist modes. · Move through the levels and play for increasingly high stakes. · Win big against progressively tougher opponents from all over the planet. · Steampunk? Classical? Pixel art fan? Find your perfect cue! · Choose from over 50 cues like the simple-but-crazy Broom stick to a beautiful masterpieces such as the Dragon. · Unlock more powerful cues as you level-up, then show off to your friends and opponents. Join millions of players now — hit the install button and play the most extraordinary pool game ever created!